This month I was assigned Annie's Noms for the Secret Recipe Club. With Thanksgiving only a week away, I wanted to make a holiday-themed recipe. 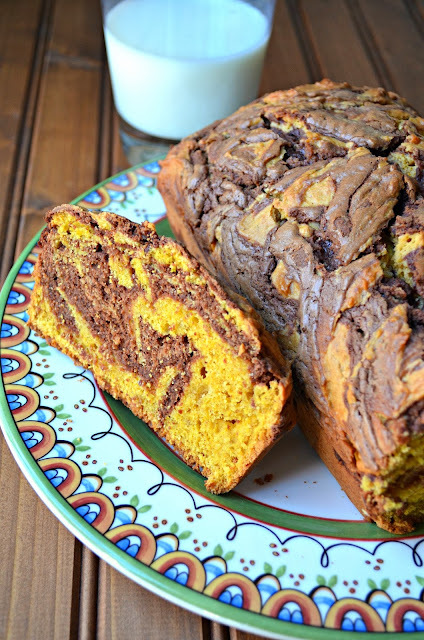 So when I saw this loaf cake that combined pumpkin AND Nutella, I knew I had found a winner. Annie has a ton of awesome looking recipes on her blog, and if I wasn't so insistent on picking a Thanksgiving recipe I really would have had a hard time picking one out! I'm glad I landed on this one, though. 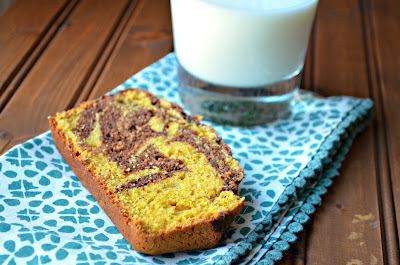 The Nutella swirl throughout the cake is really impressive looking. The Nutella actually compliments the pumpkin nicely in this moist and flavorful cake. Perfect for a Thanksgiving dessert (or even breakfast!). Enjoy! Preheat the oven to 325 degrees F. Grease a 2 lb. loaf tin. Place the butter and sugar into a large bowl or the bowl of your stand mixer and beat until light and fluffy, about 2 minutes on med-high speed. Add in the eggs and vanilla extract and mix until well incorporated. Add in the pumpkin purée, flour, baking powder and spices and mix until light and smooth, about 1 minute on med-high speed. Take 3/4 cup of batter and place into a medium sized bowl. Place 1/2 cup chocolate spread into the medium bowl and mix with a spoon/spatula until well combined. Spoon 1/3 of the pumpkin batter into the loaf pan and level off. Spoon 1/3 of the chocolate batter on top, then mix slightly with a fork until swirled. 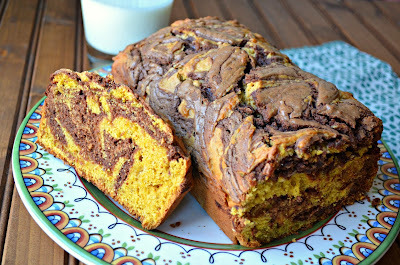 Repeat with the pumpkin batter and chocolate batter until the loaf pan is filled. Place in the oven for 50 minutes or until risen and an inserted skewer into the center comes out clean. Leave to cool in the pan for at least 1 hour before transferring to a wire rack to cool completely. Once cooled, slice and store in an airtight container at room temperature for 4 days. mmmmmm you had me at pumpkin, but nutella...seriously, sign me up! I am just loving all the delectable desserts in SRC this month! Look how wonderful that looks! Delicious! Looks and sounds incredibly tasty! Glad to be part of SRC group C with you! So pretty! Love the orange-brown contrast, and bet the flavors are amazing!! I love the way swirls look in baked goods. I think I've made this (or a similar) recipe before. Yours looks beautiful! Yum yum, these looks superb. Thanks for sharing.